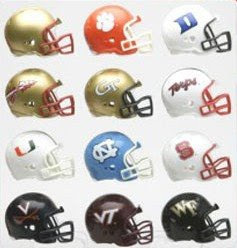 Boston College Eagles:Last year's division winner Boston College looks to make it back to the ACC Championship game and win this go around. Boston College lost a few players from a year ago to graduation but looks to have a strong team again. The BC defense is led by reigning ACC Defensive player of the year Mark Herzlich who looks to defend his title. Mark's story is an inspirational one as he had to battle off cancer to be here today. On offense the Eagles need a star to emerge, and they should look no further than Running Back Montel Harris. Just a sophomore Harris' body of work isn't large but he has star potential. Clemson Tigers:Clemson is always a hard team to figure out. They always seem to have great athletes and are able to string wins together but somewhere along the way they collapse. CJ Spiller returns for his senior year and looks to ignite the offense along with his explosive partner WR Jacoby Ford. These are possibly the two most explosive and dynamic players in the conference. The defense is packed with stars and senior leadership. The defensive line has three top notch players that all could take home postseason hardware. Clemson fans believe they are due for a huge season and several experts agree but it all comes down to how well signal-caller Kyle Parker plays. Florida State Seminoles:Bobby Bowden once again has his team prized for a BCS run, but are the great coach's best years behind him? This could be a defining season for Bowden either good or bad. One thing is certain Mickey Andrews will have Dekoda Watson, Patrick Robinson, and the defense playing well. The only question with the team with be the consistency at quarterback. In recent years this has been the Achilles Heel of FSU teams in the past and all eyes with be on junior Christian Ponder this year. Maryland Terrapins:Maryland looks to have a strong year in the ACC and head coach Ralph Friedgen needs them to. If the Terrps struggle this year good ole Ralph could be gone. Maryland will be led by two juniors. Alex Wujciak on defense and Darrel Scott on offense. If Maryland wants to be successful these two guys need to step up in a big way. North Carolina State Wolfpack:The Wolfpack have struggled in recent years but look to rebound in 2009. The Wolfpack might struggle again this year if they can't find some leadership. They have plenty of seniors that have the credentials, but somebody has to step up and take charge. One candidate is possibly the best center in the conference Ted Larsen. Larsen has been a good player his whole career now he needs to lead. On defense defensive end Willie Young will be a force to be reckoned with but can he lead this defense to success. Wake Forest Demon Deacons:Wake has enjoyed much success as the role of underdog and will play it again this season. Wake never has the best players in the conference but always manages to compete. Riley Skinner is entering the final season of his magical career and looks to go out on a high note. On defense whenever you lose a top 5 pick to the NFL you know you have your work cut out for you. The Wake d should be stout in the middle with Boo Robinson and John Russell. Georgia Tech Yellow Jackets:Georgia Tech was the surprise of the year one year ago. When Paul Johnson arrived everyone counted them out. This year the Jackets will look to improve even more and possibly get to the Championship game in Tampa. If GT can make it to Tampa it will be on the back of Jonathan Dwyer and Derrick Morgan. Miami HurricanesMiami is slowly reviving it's football program and looks to continue it's upward trend this year. Miami will have some of the best athletes in the country and should compete for the ACC Title. Speed and talent isn't everything though and the Canes will need to pull it together to win. QB Jacory Harris will lead the team in his second year if he has a great year so will Miami. North Carolina Tar Heels:Butch Davis has done an incredible job turning this Duke like program into contenders. Just being a contender isn't good enough though and everyone believes this is the year that the Heels really compete. The second youngest team in the conference looks to experience some more growing pains, but should land near the top in the standings. Carolina may have the best defense in the country led by a host of stars in the making. As is the question at many other schools in the conference, how will the quarterback play? The biggest thing Yates needs to do is not lose games. Virginia Cavaliers:The Cavs look to be in rebuilding mode this year. The Virginia cupboard is a little bit empty for Coacg Grobe and staff. A weak nonconference schedule should get them enough wins to go bowling, but I doubt they beat anybody but Duke in this tough division. The one bright spot for the Cavaliers is at corner where they have two young studs. Virginia Tech Hokies:This year's ACC favorite and only preseason top 10 team resides in Blacksburg. The Tech roster is full of potential All-Americans, and if the can pull it together this season a trip to Pasadena could be in store. Tyrod Taylor showed much improvement over the offseason and he looks to have a huge year. The defense will be tough to score on thanks to Bud Foster's attacking style defense. Then of course special teams, the area that put Virginia Tech on the map, will make the difference for the Hokies. In the first Week the ACC faired pretty well on a national spectrum. The ACC only had two losses this week, Virginia Tech lost to Alabama 31-3 and Florida State lost to Miami 34-7. The bad news for the ACC is that two of their four ranked teams went down. Also the preseason favorite to win each division lost. The good news for the conference is that they were able to get a couple of upsets against other top teams. North Carolina State was able to beat SEC foe South Carolina and Maryland beat a highly ranked California team in the Golden Bears home stadium. With a few more conference games scheduled for this week we should find out more about who the top teams in this conference are and some big non-conference games will determine where the ACC ranks among the BCS conferences. This week was a rough week for the ACC Conference. After pulling off a few upsets the first week the ACC fell victim to a few upsets themselves this week. Virginia lost to Baylor and North Carolina lost to Kansas in minor upsets, but the big upset game in Chestnut Hill where Boston College fell to MAC opponent Kent State 29-24. Another key loss was when Wake Forest was blown out at home against an underrated and up-and-coming Stanford team. The only conference game of the week was a 42-3 victory for Georgia Tech over Clemson. Week three looks to be big again for the conference. Along with the big Georgia Tech-Miami game there are also big non-conference games. Florida State will attempt to pull off a big road upset against 7th ranked, undefeated, and national championship dark horse BYU. Elsewhere in the conference #11 Virginia Tech takes on #25 Nebraska and North Carolina looks to rebound against South Carolina. It was another big week for the ACC. The ACC as a conference only lost one non-conference game in a close battle with now fifth ranked BYU. The surprise thus far for the conference has been the Duke Blue Devils, who have raced out to a 3-0 start. This week Duke will play NC Central looking to improve to 4-0. Duke is looking for their first bowl appearance since 1995. Virginia Tech good a big win against #25 Nebraska to improve to 2-1. Clemson was able to bounce back after the loss to Georgia Tech and beat Boston College and Georgia Tech keeps rolling with a win over #19 Miami. Georgia Tech is currently sitting at #9 in the polls, the highest ranked ACC team this year. This week there are three more ACC games and two of them are huge. Two feature ranked opponents and could either create mass confusion in the Coastal Division or make a clear leader of the pack. This was yet another big week in the ACC that featured the ACC Game of the Year, between Georgia Tech and North Carolina. North Carolina was able to take a commanding division lead with their victory. The conference faired well against non-conference foes with only one loss. The Seminoles were able to beat #20 South Florida 30-0. The surprise of the year, Duke, just keeps winning upping their record to 4-0 for one of the best starts in school history. This upcoming week for the ACC is a little calmer than the past few but still has its marquee games. This week also holds the most conference games in one than any other week so far. The biggest game will really test the conference, as Miami goes up against Oklahoma. This week was a big week for determining who was going to control the Atlantic Division. The Coastal Division has already played several games and most things have shaken out there but the Coastal teams haven't played many conference games so it was huge for them. Surprise teams North Carolina State and Maryland came out on top in their games improving their combined record to 9-1 and 1-0 each in conference. Preseason favorite Clemson took a hit at the same time when Maryland downed them in overtime. There is still a lot of ball left to be played, but it looks like at 0-3 defending division champs Boston College has played themselves out of contention. Duke's underdog start ended with a 33-17 loss to Virginia Tech. There are many more conference games coming in the next few weeks, and we should know a lot about the teams by then. Report: The writer of the ACC page has been fired we will suspend all reports on the ACC until a new man is hired in a few weeks.